Photo by JOSH ALDRICH -- for josh's story -- Camrose's Lee Adamson gets through the barrels at the North American Pony Chuckwagons Championship at Westerner Days on Sunday afternoon in Red Deer. 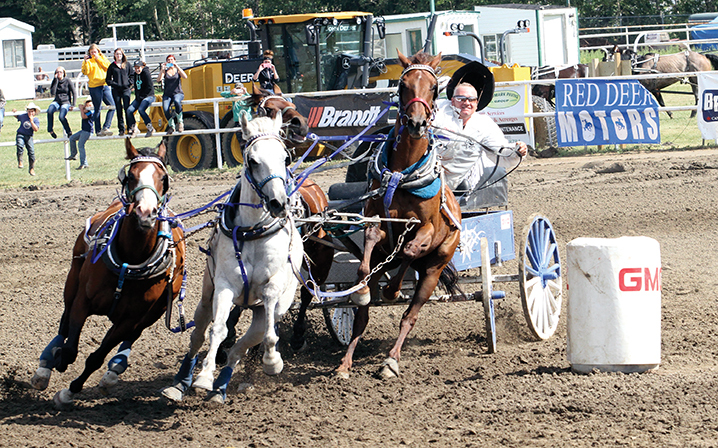 Lee Adamson may have been nipped out at the line in the dash for cash, but the blow was softened by wrapping up his second North American Pony Chuckwagon Championship — 20 years after the first — at the Westerner Days on Sunday. The Camrose driver’s overall time of six minutes, 32.43 seconds was 3.06 seconds faster than Neil Salmond of Weekes, Sask. in the Uncle Ben’s RV outfit, who did win the final race and $4,500 cheque with a time of 1:16.91. Jul. 21, 2014 4:21 a.m.
Lee Adamson may have been nipped out at the line in the dash for cash, but the blow was softened by wrapping up his second North American Pony Chuckwagon Championship — 20 years after the first — at the Westerner Days on Sunday. The Camrose driver’s overall time of six minutes, 32.43 seconds was 3.06 seconds faster than Neil Salmond of Weekes, Sask. in the Uncle Ben’s RV outfit, who did win the final race and $4,500 cheque with a time of 1:16.91. Adamson held a lead of 3.36 seconds after four heats, an almost insurmountable lead as long as he ran a clean final race but the competitor in him did not want to play safe. “You know when you’re in a heat like that, you want to win the show, but you throw it balls out, type thing. You want to make sure you’re right there with the boys and make it a good show,” he said. Even bigger for Adamson, 46, was the chance to watch his son develop over the week. Cole Adamson, 18, was driving his grandfather’s — Ray Adamson — Pidherny’s wagon in Red Deer, the third event this year he’s had the chance to do so. After a couple of tough penalties knocked him out of contention the first couple of days, he was one of the fastest drivers over the last three heats. The proud papa says he will be the new full-time driver of that wagon going forward. Adamson was the sixth ranked driver in the All-pro Canadian Chuckwagon and Chariot Association standings heading into this past week with strong showings in Grande Prairie, Saddle Lake and Ponoka. With his win at the North American Pony Chuckwagon Championships, he should jump up a few more places. In third place was defending champion and eight-time champ Keith Wood out of Saddle Lake in the Westock Frame & Wheel Alignment Ltd. rig in Red Deer at 6:36.22, while Sedgewick’s Curtis Hogg was fourth at 6:36.23 in the Kellough Enterprises Inc. wagon. Rounding out the top 10 were Louis Johner of Mayerthorpe (Paradise RV in Red Deer, 1:17.43 on Sunday, 6:31.13 total), Gary Thiel of Sherwood Park (Pumps & Pressure Inc. in Red Deer, 1.18.07 Sunday, 6.37.42 total), Kevin Desjarlais of Elizabeth Métis Settlement (The Pipe Yard in Blackfalds, 1:17.79 Sunday, 6.37.58 total), Brian Miller of Drumheller (Westerner Park Board of Directors, 1.17.73 Sunday, 6:40.22 total), Eckville’s Marvin Hubl (Eldorado Pressure Services in Rocky Mountain House, 1:18.11,6:42.68 total), and Chance Thomson of Alder Flats (PureChem Services, 1:20.53 Sunday, 6:43.66 total).